Today, the Spring Equinox marks the changing of the seasons. Longer days, warmer weather, flowers blooming & the birth of wildlife – the perfect time to get out-and-about with your camera. The Spring Equinox marks the astronomical beginning of spring, as the Sun moves north across the celestial equator. The term ‘equinox’ originates from Latin – with the meaning ‘equality of night and day’ – and is appropriate here as both halves of Earth experience equal amounts of day and night. Not only is this the first day of spring but today also marks the first ‘super worm moon’ to occur so close to this date since the year 2000. This celestial event takes it name from the full moon – where the full lunar disc appears larger and brighter than usual – as well as the time of year when earthworms begin to emerge from the Earth’s soil. Springtime is about life and rebirth; it brings about some light relief following the cold winter months. With this in mind, now is a good time to give your camera – and your photography skills – a bit of a spring clean! We have seven top tips to help you get started. …are fabulous, especially at springtime. Nothing says spring quite like a field full of daffodils. This season is so rich, however, that there’s so much more out there to capture. Don’t just stick to familiar content but go further afield. Spaces will be bursting with budding trees and blossoms, young chicks will be nesting on the riverbanks, and more people will be venturing outside to enjoy the warmer weather. Don’t be afraid to bring more variety to your shots. Known as the season of renewal, landscapes are given a new lease of life and explode into colour. You can take this opportunity to look further than individual plants or flowers: try to shoot in ‘blocks’ of colour. Look for fields, valleys, and clifftops which span the horizon. For even more striking images, look beyond blocks of colour which are simply neat and tidy – although these can be amazing too – and photograph areas where different contrasts of colour reside. There are many advantages of shooting from a low-angle perspective. When photographing wildlife, for instance, a low-angle enables you to portray the animal from its own perspective, as opposed to a human one. This helps you to capture your subject with more intimacy and understanding. Shooting from very low on the ground, while generating more stability, also helps to render the background with more subtlety, thus helping to further expose your subject. Taking a photograph from a higher viewpoint, on the other hand, tends to make backgrounds quite sharp. Above: eliminating the horizon in your shots can also help to add variety and added dynamism to your photography. 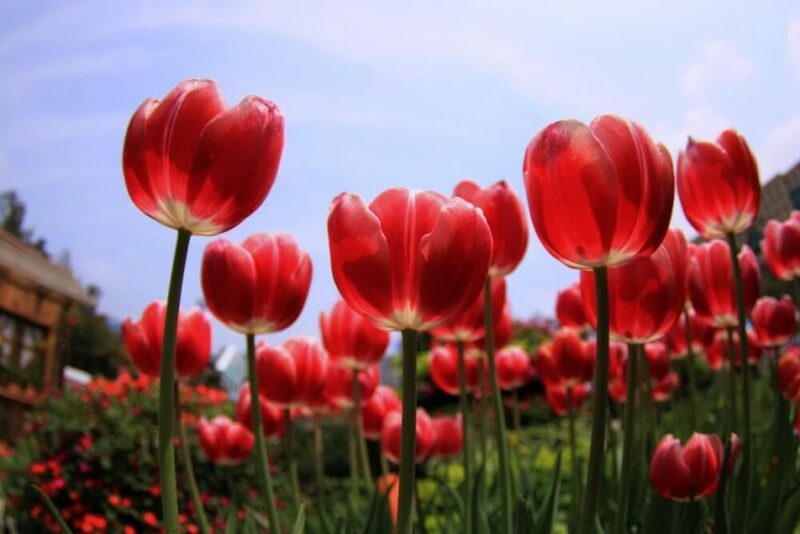 The absence of a horizon in this image, gives these tulips a striking resonance. While it is quite tempting to stay indoors when wet, spells of more unsettled weather can offer endless opportunities for photography. Springtime is stereotypically associated with warmer temperatures and sunny skies but the rain is definitely no stranger either. Mist is quite common for this time of year – when warm and cold air collide – which can create some fascinating compositions. Light cutting through mist, illuminating morning showers, is a stunning sight to capture. Equally, a stormy sky along with its blackened cloud can create a perfectly moody background against bursts of colourful flower. When the weather is more pleasant, sunshine can help breathe life into your photos – but try not to forget your flash, even in these conditions. Bright sunlight will create harsher shadows but forcing your flash in these situations will help to illuminate those darker areas when capturing close-ups. Springtime photography is often full of luscious landscapes. These can create striking images but switching things around, so that you eliminate the horizon, can also lend some creative flare to your shots. Why not try capturing a field of tulips against the vast expanse of blue sky or shooting the cliff’s edge from above? Depending on the photographer, taking pictures can be quite a solitary, private practice. Even if you are hesitant to show your images to others, especially if you are just starting out or in the process of honing your skills, make sure you study the work of other photographers. Especially with the advent of the Internet – and social media more specifically – there are endless places available for inspiration. Joining online communities, following your favourite photographers, and even learning about local photography meet-ups in your area, are just a few ways in which to use the Internet productively as part of your practice. If you feel comfortable doing so, online spaces are also incredibly rewarding spaces where you can receive praise and constructive feedback on your photographs. Of course, not everyone on the Internet is there to be helpful but look for the right inclusive communities to help your love for photography thrive.